PARIS? The second model of Europe's automated spacestation cargo carrier will not be launched until February 2011 at theearliest,rather than in December as planned, in what European government andindustryofficials said Sept. 21 is a classic conflict between commercial andgovernmentcustomers that use the same rocket. Thedecision to delaythe launchof the second 20,000-kilogram Automated Transfer Vehicleto the International Space Station will require the 18-nation EuropeanSpaceAgency to negotiate with NASA and the other space station partners on asuitable backup launch date. Thesenegotiations may not be easy, government andindustry officials said. "Wewill sit down with our partners as we have donefor more than 10 years now and we will find a solution," ESADirector-General Jean-Jacques Dordain said in a Sept. 21 interview,referringto ESA's proposed February ATV-2 launch date. "These problems areresolvedthrough compromise and negotiations." Europe'sATV cargo ships are unmanned spacecraft the sizeof a London double-decker bus. They can carry up to 7.7 tons of cargoto thespace station and are expendable. At the end of their missions, theyarecommanded to burn up in Earth's atmosphere. 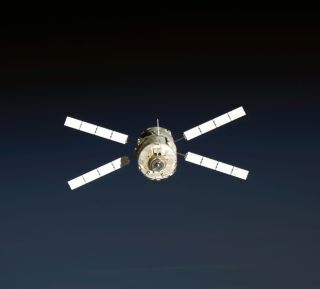 Thefirst ATV craft, ATV Jules Verne, launched to thespace station in 2008. This second vehicle is called the ATVJohannes Kepler.A third vehicle, named after Italian spacepioneer Edoardo Amaldi, is in development. Simonettadi Pippo, ESA's space station director, saidshe regretted the delay but was nonetheless proud of the ATV-2 team'sabilityto keep the vehicle's assembly and launch preparations on schedule forthe past18 months. Ina Sept. 21 interview, di Pippo said any delay from aDecember launch will be due to factors unrelated to the ATV-2'sreadiness.Vehicle preparations at the Guiana Space Center spaceport in FrenchGuiana areconsistent with a December launch date, she said. Dordainagreed, saying ESA had established an independentboard of inquiry, headed by the ESA inspector-general, to assess thevehicle'sreadiness. Dordain said that review concluded that ATV-2 could make theDecember date. Onthe other side of the ATV-2 debate is the Arianespacecommercial-launch consortium of Evry, France, which is struggling tomake upfor time lost earlier this year when its operations were suspended tocorrect adefect in the helium-pressurization system of the Ariane 5 vehicle.Operationswere delayed more recently to accommodate the late arrival of acommercialsatellite requiring a last-minute parts replacement. Theresult is that Arianespace, which had planned tobegin its 2010 mission year in February or March, was obliged to waituntil Mayfor the year's first launch. The company had hoped to conduct seven Ariane5 missionsin 2010, equaling a record set in 2009, but now will beable to conduct six at most. Ithas now scheduled launches, each carrying twocommercial telecommunications spacecraft, for late October, lateNovember andlate December. Ina Sept. 21 interview, Arianespace Chief ExecutiveJean-Yves Le Gall said inserting the ATV-2 flight into the 2010manifest wouldhave meant scrapping all three commercial launches now planned betweenOctoberand December because of the special requirements of an ATV flight. TheAriane 5 ES model that will place the ATV-2 into lowEarth orbit uses a special upper stage that requires major preparationat theGuiana Space Center spaceport in French Guiana, especially since thisstagefailed in a 2001 mission. Thatfailure resulted in a series of stage-preparationprocedures that Le Gall said cannot be compromised. The proceduresblock mostlaunch-base activity for the eight weeks preceding the launch of ATV. "Manyof us remember that launch and I can tell youwe are not cutting corners on the preparation of this stage," Le Gallsaid. "We cannot handle other payloads at the launcher-preparationfacility during the eight weeks leading up to an ATV launch. That wouldmean nofurther operations for us starting in late October if we were to launchATV-2in December." Theconvention that spells out relations betweenArianespace, the French space agency (CNES) and ESA includes astipulation thatgovernment launches be given a preference in the event of a conflictwith commerciallaunches.This has rarely occurred with Arianespace, in partbecause, unlike the launch manifest for the U.S. Atlas 5 rocket,Arianespacehas relatively few government satellites to launch in a given year. Dordainsaid the decision on how to juggle government andcommercial flights is made collectively based on a common-senseassessment ofthe tradeoffs. "Yes,our convention with Arianespace does makereference to a 'preference' for government launches," Dordain said. "But that does not mean I can ask Arianespace to violate commercialcontractual obligations. I can't tell Arianespace to never mind itscommercialcustomers, any more than I can tell our space station partners to nevermindthe imperatives of space station traffic management." WhileNASA's space station managers may have to struggleto fit the ATV-2 launch into the schedule for February given what elseisexpected at the station at that time, they have an extra incentive:ATV, inaddition to its cargo-carrying duties, is needed to reboost the stationintoits operational orbit. Such a reboost is required sometime betweenFebruary andApril, di Pippo said.